When Richie Dixon parted company with the Scottish Rugby Union after nearly 30 years - during which time he had coached at every level from juniors to the national team and had then been responsible for coaching development - he promised his wife he would be retiring. The International Rugby Board had invited him to join their team of high performance consultants and that would stop him from becoming bored but he was definitely hanging up his boots. Two and a half years later he is Head Coach of Georgia and busier than ever. "It was something of a surprise when they offered me the job but then I thought, 'what a chance!' They had already qualified for the World Cup and the opportunity to be a part of another World Cup and one taking place in New Zealand was too good to miss. I couldn't think of a good reason to say no," he says with a laugh. The Georgian connection began when The IRB asked him to supervise a development plan as part of their scheme to assist the tier 2 nations. In October last year the President, George Nijaradze, made him his senior advisor and within a month offered him the job of national coach. Dixon, 65 next January, simply could not resist. Instead of putting his feet up they have hardly touched the ground and his wife has scarcely seen him. He has spent the last four months in Tbilisi and has never worked so hard in his life. "They're so enthusiastic - they're a nation made for rugby and they want to talk about it morning noon and night," he says. "My wife has been out for a couple of visits but she has to spend most of the time by herself so it doesn't really work." His only regret, though, is that he has not had enough time with the players. "If I had had them for two years I honestly believe we would be looking at getting through to the knockout stages," he says. "There are only about 750 senior players but playing numbers are up to five or six thousand overall. In the past there was a chronic shortage of pitches and many games took place on rough ground - car parks and the like. Now there is a proper development programme and facilities are improving rapidly." Most of the national team play professionally in France but seven of this World Cup squad are home-based - an important signal that you do not have to go abroad to make it, says Dixon - and the increasing popularity of rugby was confirmed when prop David Zirakashvili was voted Georgian Athlete of the Year. There is a great tradition of wrestling in Georgia and Dixon admits his greatest challenge is to expand their game because they simply love scrummaging. Zirakashvili plays for French champions, Clermont Auvergne, whilst another prop, David Kubriashvili, regularly keeps the great All Black Carl Hayman out of the starting line-up for Toulon leading some to claim they are now the best two props in the world and it is not just props who are making their mark. The French media chose Montpellier back-rower Mamuka Gogodze as the best foreign player in the Top 14. 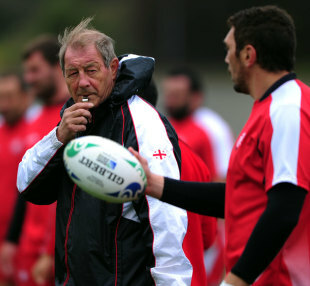 They have certainly come a long way since their first foray into the World Cup in 2003 saw them lose 84-6 to England. They lost every game in that tournament but in 2007 they beat Namibia 30-0 and frightened the life out of Ireland before going down 14-10. They are now up to 14th in the IRB rankings and have overtaken Romania as the top country in the European Nations Cup, the next tier down from the Six Nations Championship, so there was genuine disappointment after losing 15-6 to Scotland today. Dixon felt they had blown a great chance to make a big statement to the rugby world. There was no satisfaction because they had prevented Scotland from scoring a try - as far as he was concerned they had frozen on the big stage and it left him feeling very frustrated because he knows they can perform at a higher level. He admits he would rather not have played against Scotland but now that is out of the way he is desperate for Georgia to make a mark. Victory over Romania is an absolute must but showing they can compete with the top tier nations is what this World Cup is all about so next Sunday's game against England in Dunedin is an important yard stick. After this World Cup Dixon promises he will step back - "I'll still be involved but I would like to think it will be in an advisory capacity rather than hands-on coaching," he says. Don't bet on it. It is obvious he feels real excitement about where Georgian rugby could go and it is definitely a work in progress so it may well be a couple more years before he swaps boots for carpet slippers.